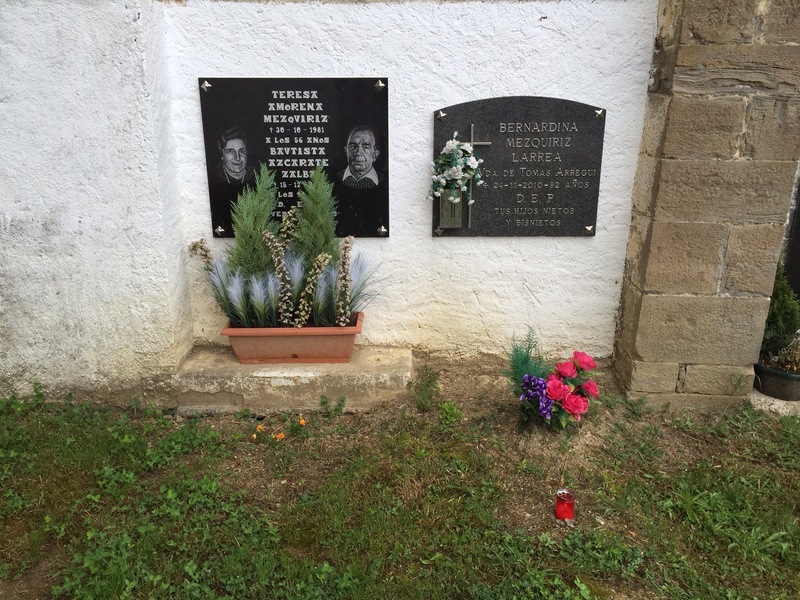 There is a small, vey small, public cemetery at The Abbey that houses only a handful of markers for the families in the nearby villages of Ilarratz and Eskirotz. The church, formerly the parish church of St. Lucia, would have served both communities. Every few days, someone from the towns comes by to tend the graves. There is no shortage of plastic flowers, as is the custom in most graveyards, particularly in Spain, and someone has planted pansies. But just the other day, an older woman, mid-fifties I would assume, left a bouquet wrapped in plastic at one of the graves. It would have been the second anniversary of a man who was only 65 when he died. Possibly, her husband. There is one grave marker that show three members of a single family who died within days of each other in 1971. Possibly a flu epidemic, or other disease, these people are remembered here under a name that is possibly their sister or mother, it is hard to be sure, not knowing what happened. It is also hard for this city girl to imagine what life would be like, living in a village with a population of barely a handful of hearty souls. The Basque way of life out here is not easy. The weather is miserable, even now in the end of May. And yet, somehow this culture, this area remains some of the most beautiful and generally the best looked after of all the Camino. What is remarkable is how reverent most pilgrims become when they walk into the church or pass by this lovely cemetery. Men remove their hats, women bow and cross themselves, and two young girls this week asked if it would be proper for them to enter the church wearing shorts. And all the while, I think of the property being neglected for so long, not serving the needs of pilgrims, barely supporting those with loved ones in this graveyard. There is one marker that is the oldest and the most touching. 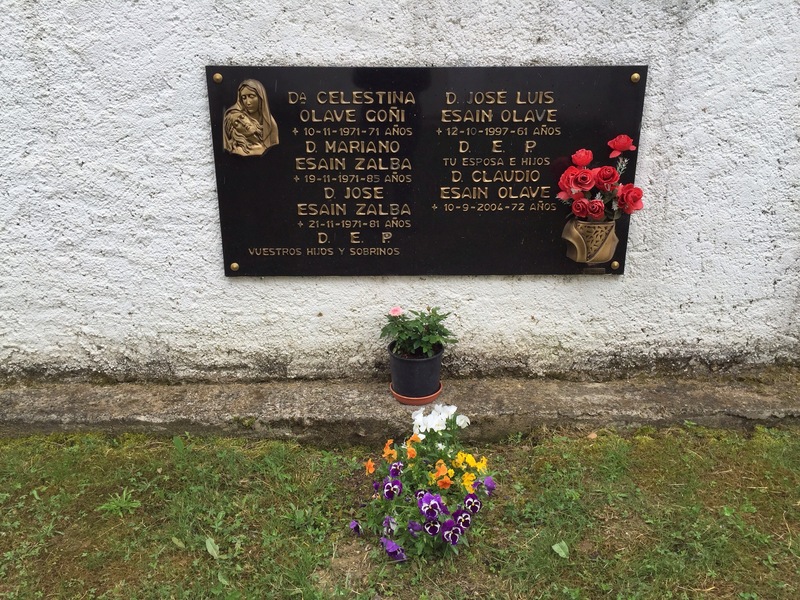 It marks the graves of three members of one family: the father, the mother, and the son who most probably died during some local conflict during the Spanish Civil War. Ernest Hemingway made it all seem so romantic, but families lost their children, children lost their fathers.The other graves are more modern looking, certainly more recent. 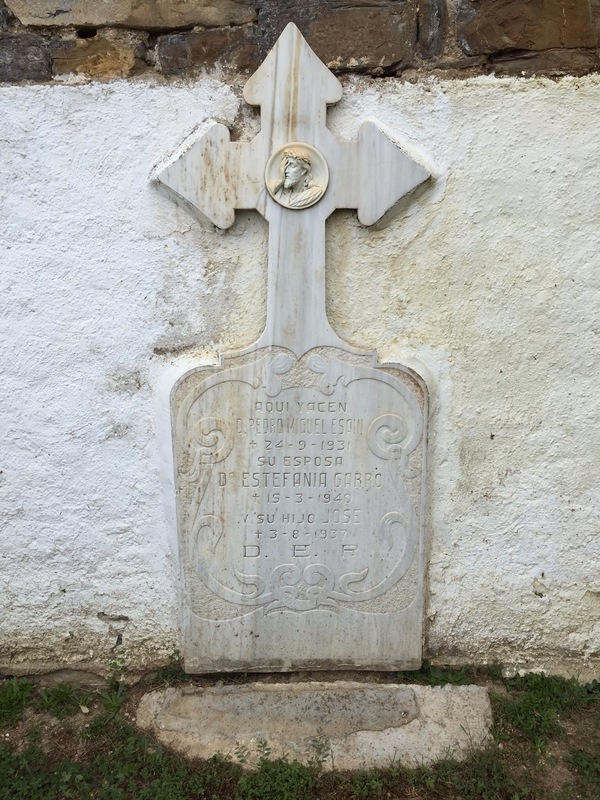 A cemetery that most likely houses the remains of the many monks who would have lived here centuries ago is identified on a map from 1871, up the hill across to the other side of the Camino and the modern road. There is a man in town who found skulls on the property and someone claims Moors are buried here as well. Most days no one comes to this cemetery. But pilgrims who visit The Abbey sometimes stop to pay their respects to the strangers buried here. Posted in Camino Frances. Tagged caminodesantiago, Spain, the_abbey. Next: Next post: What is Breakfast Like on the Way to The Abbey?